The 2017 Ford Mustang has earned glowing praise from top critics in the automotive industry regarding the features drivers love most about this outstanding sports car: its supercharged performance, luxurious interior comfort, and innovative technology. Leading automotive critics such as Edmunds, MotorTrend, Kelley Blue Book, and ConsumerGuide® are impressed by these details, and commend Ford’s commitment to keeping this iconic vehicle at the top of its class. Read more about what the critics had to say before contacting Glenwood Springs Ford to experience the best features of this vehicle for yourself! Edmunds gave major praise to the Mustang’s engine options: 5.0L and 5.2L V8 versions, a 2.3L GTDI EcoBoost®, and a 3.7L Ti-VCT V6. All are supported by powerhouse six-speed transmission, including SelectShift® and TREMEC® options. Any one of these selections will ensure that you have one of the most powerful vehicles on the streets of Rifle. No one will mind being in the 2017 Mustang GT trim, with its ambient lighting, dual-zone climate control, 50/50 split-folding rear seating, six-way power adjustable heated and cooled front seating, and a twelve-speaker Shaker™ stereo. Whether you’re simply running errands in Eagle or on the road for a longer adventure, passengers will be able to stretch out and get cozy in the cabin of your Mustang. In addition to those highlights, the superb SYNC® 3 system also includes Siri® Eyes Free, extensive turn-by-turn navigation, and a capacitive touchscreen responsive to swiping. You’ll never have to disconnect from your technology – even when you’re on the open road. As well as having top-of-the-line specs, the 2017 Ford Mustang V6, EcoBoost®, GT, and Shelby® GT trims are in a very appealing $24,915 -$62,070 MSRP range. 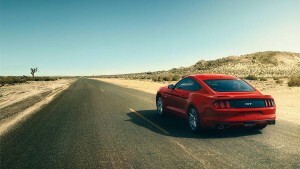 With the Ford Mustang, you can access luxury for a fraction of the price of comparable vehicles from other manufacturers. Are you ready to experience the 2017 Ford Mustang? Set up a test drive and review it for yourself at Glenwood Springs Ford! Contact us online or just stop by our 55 Storm King Rd. showroom Monday through Saturday to check out the Mustang’s array of features and see why it’s such a favorite in our region!